A WOUND IN TIME: MORE RAW CLIPS!!!!!!! Though the struggle is REAL we have still managed to create magic thanks to a wonderful cast and crew. THANK YOU ALL! Still trying to scrape my pennies together to resume filming. A fundraiser may be on the horizon thanks to a dear friend... Stay tuned. 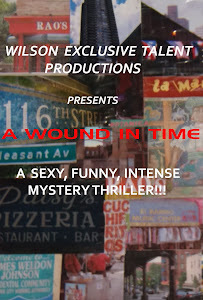 Nice to know that "A Wound in Time" has caught the interest of a prominent Los Angeles film distributor as they recently contacted me again and would like me to keep them updated on the film's progress. Meantime, enjoy these RAW one minute clips from what we shot in July.